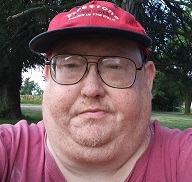 Joseph "JoJo" E Staley, Jr.
Joseph Eugene "Jo Jo" Staley Jr., 48, of Chester, Nebraska died Thursday, April 4, 2019. He was born December 4, 1970 in Atchison, Kansas to Joseph E Staley Sr. and Cynthia Lou Staley. After graduating Wymore Southern High, he worked as a butcher at the local grocery store, eventually he worked to get his CDL to become a truck driver before becoming disabled. He was an avid fisherman and enjoyed camping along with photography. He was preceded in death by his beloved mother Cynthia Lou Staley. He was survived by his father Joseph E Staley Sr., brother Karry Lee Staley, sister in law Carmen Cisneros, his nephew Joseph Lee Staley, and numerous other family members and friends. Direct cremation was chosen and a memorial service will be held a later date　Price Funeral Home, Hebron assisted the Staley family with these arrangements.